Once again it was straight uphill from the campground. Tom caught up to me when I was on the first downhill. He was riding a Bike Friday. He said he was a New Zealand dealer for them. I lost Tom when the road turned upward once again. Basically the same steep gravel riad climbing that I have become acustom to. There were a few places where I got off and pushed. Eventually the road took a dive down to Port Charles. Not much there except some vacation houses. 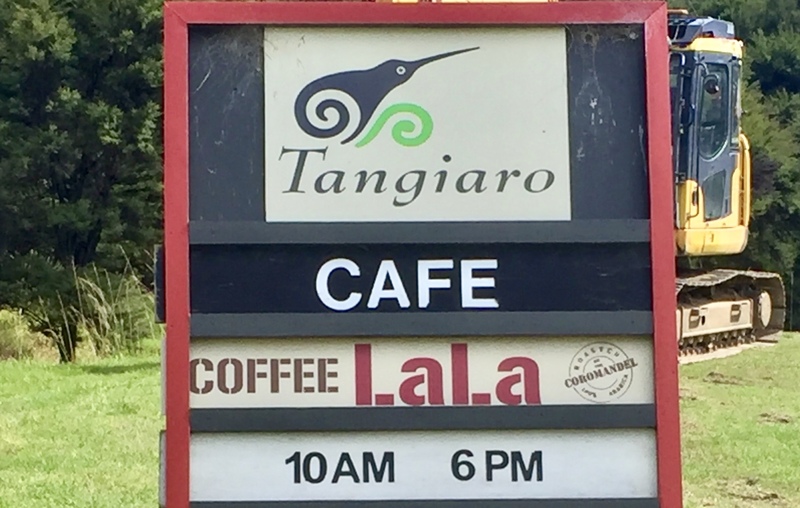 When I got to the south end of Port Charles I saw a sign for the Tangiaro Resort and Coffee LaLa. Just what I needed before tackling the nect big climb. 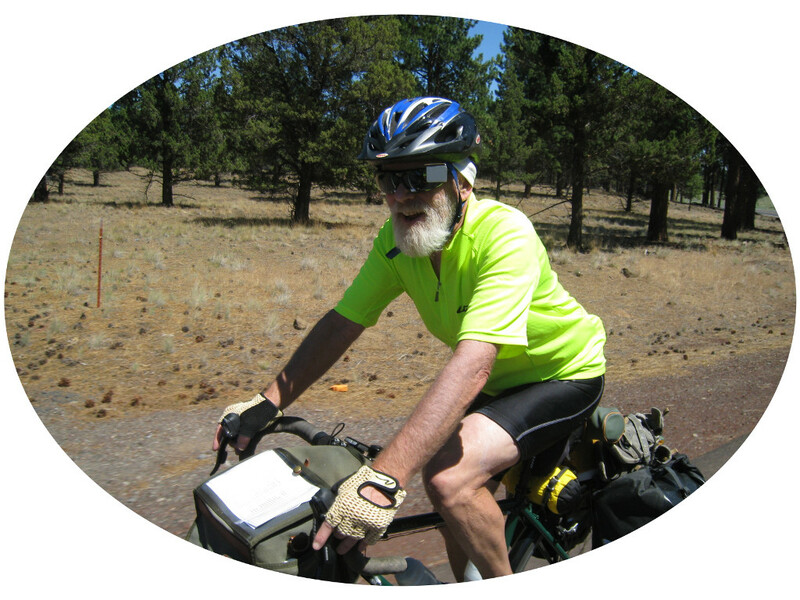 I was then back on the road and heading upward, but not as steep as the last grade. Here I was able to stay in the saddle and keep cranking. Pretty soon Tom came along in the opposite direction. He turned around and rode with me for a while. He still has family in Oregon. Then Tom and I parted ways and it was over some more hills and then down to Waikawau and then Little Bay. Mark and Nedilka had made a sign so I could easily find the place. They were at the beach so I relaxed and had a shower before they returned. We had some excitement on the drive home. After an hour and a half drive we stopped at Coromandel Town and I got out. I looked at my bike and something was not right. It took me a minute to realize my rear wheel was gone. It had fallen off somewhere along the way. How could this happen? There was quite a bit of rough gravel so I guessed it just shook loose. Mark did not hesitate to turn around and drive back. We had our eyes glued to the road all the way back to Waiklawau when there it was in the grass on the side of the road, completely undamaged. 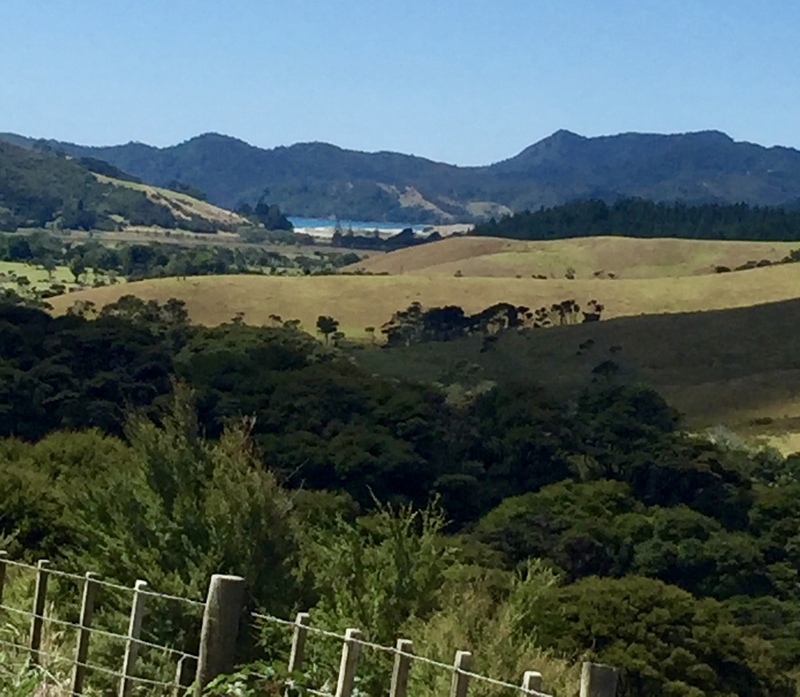 We took another, more scenic road back to Coromadel through Kennedy Bay. Total detour time, 2 hours and 15 minutes. That wasn't the end of the excitement. When we got home my front tire was completely flat. Further examination reveled that it had been rubbing on the bike rack and had worn a big gash in the tire and through the tube. I would have to purchase a new tire. Bummer because I really like the Big Ben's I have on. After the big climb out of Stoney Bay I was back on top looking down. And then it was down down down to Port Charles. I was very happy to see a Coffee LaLa sign. Very nice resort, now very quiet in the off season. I had a coffee, a brownie, and some juice. Just what I needed to tackle the next hill. 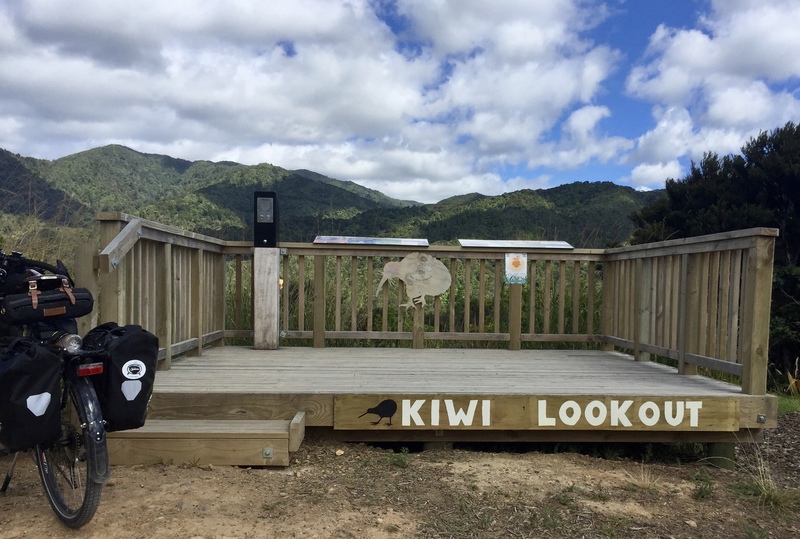 On the next big climb they have this Kiwi Lookout. The thing on the left lets you listen to recorded male and female kiwi sounds. 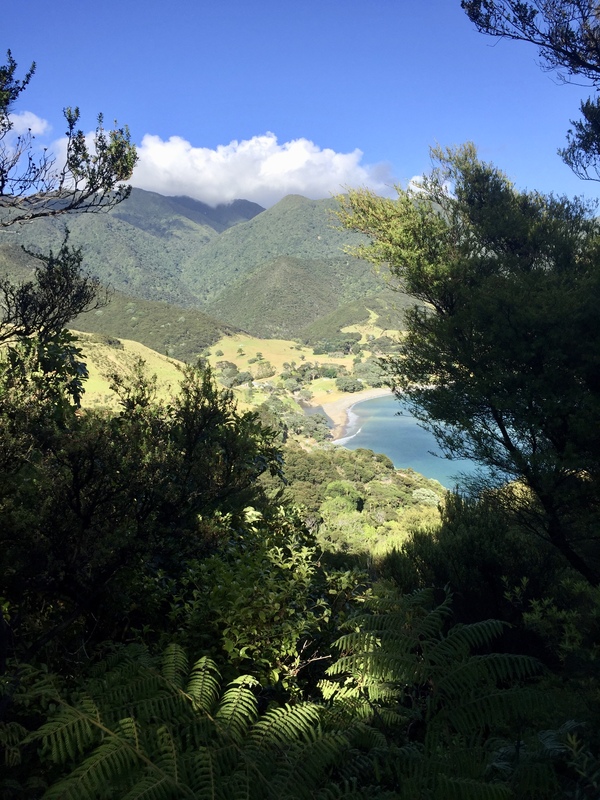 This is what the hills look like on the climb between Port Charles and Little Bay. One last sunset on the drive home, from one of the higher points on the Coromandel Peninsula.